When you've been at a place twice or thrice, a slight difference in the area is not difficult to notice. I pass by Gorordo Avenue frequently when I ride the taxi on the way to work and Marjos Pochero have lately been a tease since it opened sometime August, this year. So one lunch time, I and a colleague, being slaves to a restotour (restaurant hopping) challenge, decided to pay the place a visit. Marjos Pochero is a restaurant which specialty is just exactly what its name parades - POCHERO. This type of dish takes its origin from Spanish cooking and is served then for the elites since the Spaniards wanted nothing less than "de primera calidad". It is beef stew made from choice ingredients of fresh vegetables, some fruits, and beef shank cooked under regulated heat and pressure. Without hesitation we entered the gate of what looked like a wooden fence and stepped on a shaded cement platform. The restaurant has no wall coverings, except for their kitchen where cooking is done. Right in front of the kitchen is a glass shelf displaying all other dishes one can order a la carte - lechon kawali, chicharon bulaklak and many more. The wall behind the attendants holds what looks like a gigantic menu listing all other food they have available for sale. 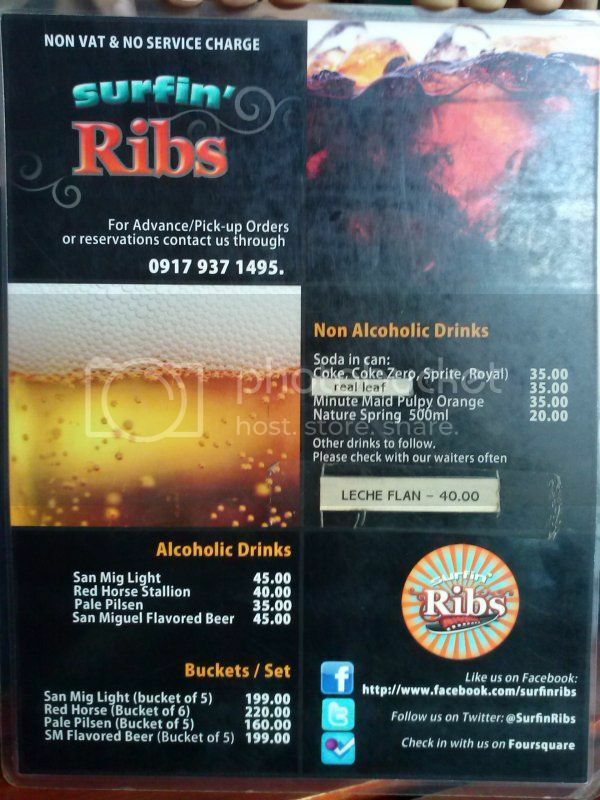 This type of setup is quite telling of the type of patrons they intend to cater - the middle income earners which make up most of the Filipino population. Service in the restaurant is quite fast. Not long after 10 to 15 minutes have elapsed, the simmering beef stew was already served in a white porcelain bowl. We were told not to drink the soup directly mouth to cup because it is hotter than we think we can handle. And true as we were told, even the spoon scoop burnt a little our tender tongues. Warm soup in the stomach to me is always the most satisfying in an eating routine. I wouldn't mind perspiring. Their version of pochero soup is a little too tangy (or sour) and salty too. I find this flavor a little dominant in most pochero houses in Cebu. I could be wrong to say that it is Cebu trademark but the ones I have tasted in Negros was not as sour as it tasted. It was the kind of mix that would be perfect when poured over a plate of bland plain rice rather than sipped from the cup. In my opinion, the sourness may have been due to too much dabong (bamboo shoots) in the ingredients. But its just me. Others probably find that a plus especially for those whose palate loves that particular item in the dish. Despite that, I would commend their pochero for its fresh beef, nicely tendered, and served in huge size. The one we ate was enough to accommodate for 4 persons. The cabbage was cooked enough to still have its crunch and the corn was sweet. 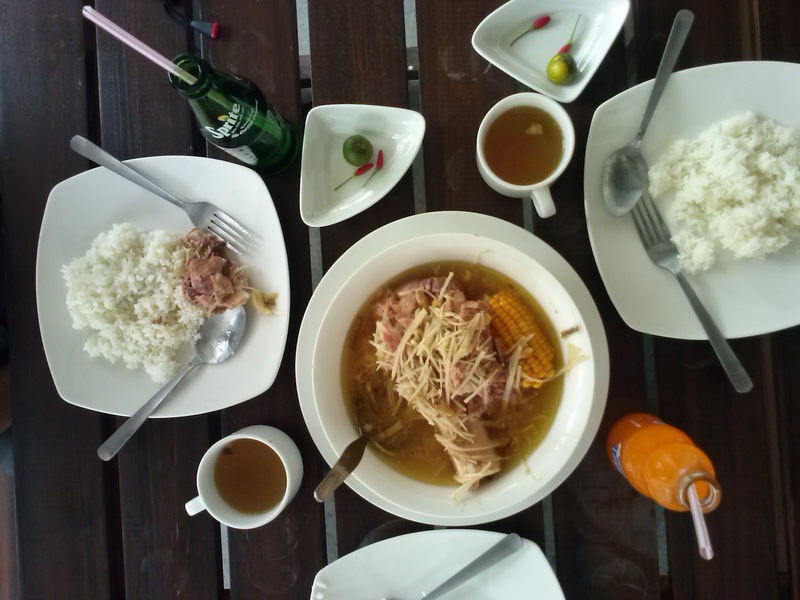 Our lunch which included the pochero, rice, and softdrinks cost us a total of P400. Not bad if shared by three or four. For more pictures, visit their Facebook page. 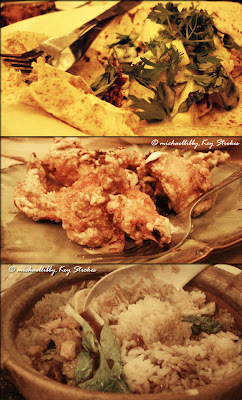 See related reviews by Market Manila here or find a sample Pochero recipe in this site. It started when I read Mustachio's blog. I was just watching a google image that showed a thumbnail of a very familiar picture I suspected was of Sumaguing cave in Sagada. 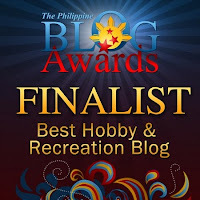 I clicked it only to be directed to a familiar blogsite. When the header populated, I knew it was Khonie's. Amused to find out that she credited me for having taken the picture she posted in her site, I scanned to her other entries. 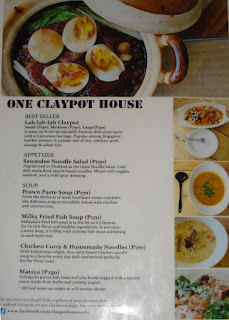 Alas, I chanced on an interesting mustachio article about One Claypot restaurant. One Claypot is located just a few steps away from one of the newest 7 Eleven branches in Cebu. It's just across the Capitol (NOTE: The shop has since changed to a new location. See address at the bottom of this post.) and along the road at the back of La Fortuna. Its signage isn't that huge, so if you are walking along that road and expecting to see humongous banners of the shop, you will sadly walk past it without seeing any. And if that happens at brisk strides, how much more if one went to locate it using a car or a motorcycle? At broad daylight, its exterior is just ordinary. The more colorful laundry shop beside it catches even more attention than its plain white painting. 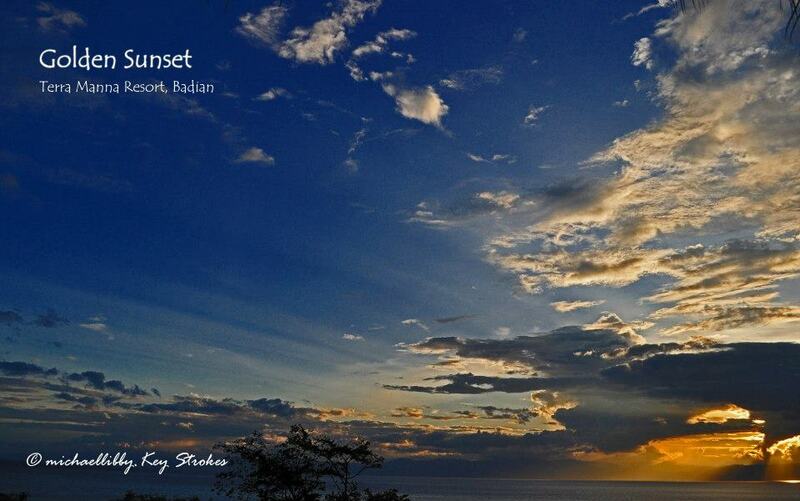 At night, however, and talking about it at present, it happens to be the brightest and liveliest spot in that area. In terms of size, it is best described as cute: 2 family-sized tables and a table for two, a small kitchen behind a partially glassed wall, small hanging chandeliers, wall decors, and tiny decoratives lined at the kitchen wall. As if not content with the light from the ceiling, tables are also accented with tiny candles in clear glasses. Given that description, the place can be pop for romantic dining (if it ain't crowded), or appropriate for small group get-togethers where friends are up for light conversations. It is not a good place to be loud and noisy especially when other diners are eating at nearby tables. A loud laughter easily reverberates inside. There are at least two waitresses who are alert at taking orders. For dinner, we took the interstingly-named specialty of the house, Lah-lah-lah Claypot (Large), Matsya, and a platter of Chicken Wings. Lah-lah-Lah Claypot is said to be of Cantonese heritage. They say that cooking using this method requires more time than when using metal wares. Rice is put inside the claypot with sufficient amount of water before it is heated. When about 70% cooked, the rest of the ingredients are added until all the flavor coming from the mix blends and spreads. It is a preferred style of cooking for most that are familiar with it because the moisture is retained inside the pot while steam circulates the smell and flavor of the different ingredients until it unites making that distinct taste. In this version, I and my friends enjoyed the taste of rice rich with sweet, spicy syrup, flavored pork cutlets, and slices of hard-boiled egg and chorizo bilbao. The latter turns out to be the most prevailing ingredient of the dish both in scent and taste. As if to add contrast to the color of the dish, a leaf or two of a vegetable were added. Matsya is a pita bread dish that comes with a slice of parrot fish mixed with yoghurt, chunks of fresh cucumber and cilantro/coriander (wansoy) toppings. The dominant flavor in this dish is "wansoy". Its tang or mint is hot in the taste bud which immediately became my friend's disappointment. I on the other hand, find its degree of saltiness a "pull back". I think the salt came from both the bread and sour yoghurt mixture. For vegetarians, this could be a typical pick at quick scan on the menu. The last dish we ordered was a platter of chicken wings. Chicken was cooked appropriately, not dry, nor undercooked. Although the menu did not spell the secret ingredient that made its coating unique, we suspect that it was usual batter with shrimp paste for an additive. 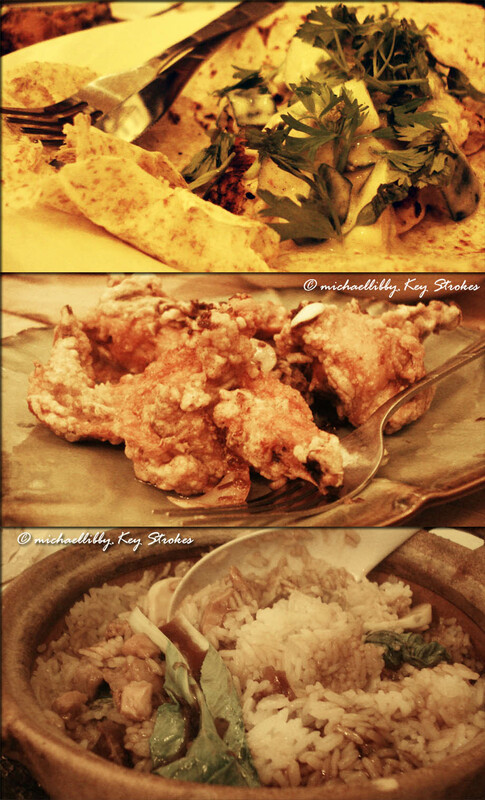 It is not crispy fried chicken but tender and juicy. 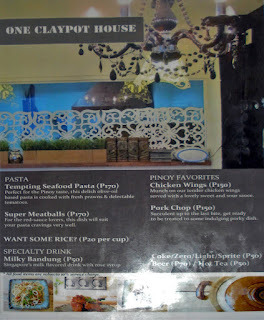 Since the food in the pot left us beaming we decided to maximize gratification by ordering an additional medium pot. We ate until we were full and stuffed. The entire meal for us 4 cost a total of P1,210 inclusive of the 10% service charge and 2 canned sodas. 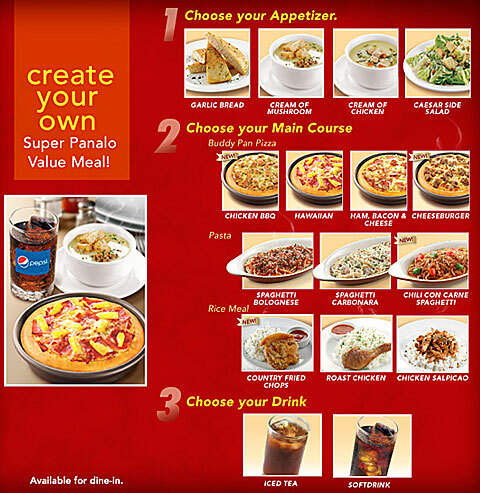 Who says Pizza Hut only makes pizza? They make good pastas too. People go to food shops to scout for the cheapest meal set. Probably not everyone, but most people do. Wise buying, they say. is purchasing goods that have value for money. Only millionaires hit a shop and browses a menu based on appealing graphics or classy sounding names then snaps the finger to place the order. The common and rather wiser customers hit the shops and scout for the options that suit the budget, look at the picture if it is appealing, ask recommendation or common feedback about the selection from the waitress, pause... then finalize the order. I happen to be one of the thinking customers (a common). 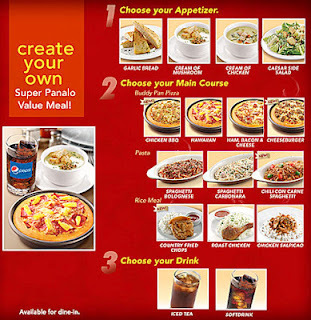 Like today, in a practice where you kind of use your craving as a compass to point the direction towards your food destination and your mind like a recorder where you rewind in search of shops that offer a match to your craving, I decided to stop at Ayala's Pizza Hut. I was tight on budget and resolved to spend lightheartedly no more than a hundred. Crediting the dependability of my compass and recorder, I wasted no time ordering my usual set: 1) Ceasar's salad, 2) Spaghetti Bolognese, and 3) iced tea. As I have mentioned earlier, the store's not just about pizza, it's about everything else too like the aforementioned items. PH's Ceasar salad is a plate of fresh green leafy lettuce (the non-typical type), croutons, fried bacon cutlets, and that sour-sweet, salty dressing combined to make that mouth watering entree. A dash of pepper and "who knows what else" leaves a spicy taste in the tongue. You know the leafy vegetable in a salad is fresh when it is crunchy and succulent. The second entree was pasta, not pizza. Spaghetti bolognese is pasta in a stylish baking bowl with rich spaghetti sauce on top baked under sufficient temperature enough for cheese to melt evenly with the meat sauce. It's served with regular precautionary statement from serving staff "Be careful. The food is hot." It is best to have buddies around or play games on a smart phone when it is served so you do not stare funny at it until it's cooldown. It does take a good 3-5 minutes before it becomes ready for digging. Drink the cold glass of iced tea prepared with just the right sweetness for finish. Leaving the store after eating the same set of entrees oftentimes make me forget that they make good pizzas too. Oddly true. I thought food blogging passed by me already until a long list of restaurants paraded before my eyes on my computer screen. It was a page referred by my colleague one Tuesday morning at work (see what lazy days can do to diligent employees?!). I browsed through it and noticed that some of the names seemed familiar but haven't been seen nowadays. When we checked on the posting date, it showed 2005. It's amazing how time quickly flies and some things run out of circulation too fast. Regardless, it was still a challenge hit on me hard at the time most unexpected. Just today, while my confrere kept blabbering about food and restaurants, my ego hit on me again and I decided to give in. My hungry cells traveled straight to my brains in great speed, automatically scanning the perimeter like a satellite looking a kilometer radius away from Pioneer Building (my location). 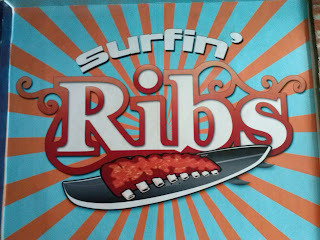 Like as if search is over and the target's located, I said "Surfin Ribs" excitedly aloud. 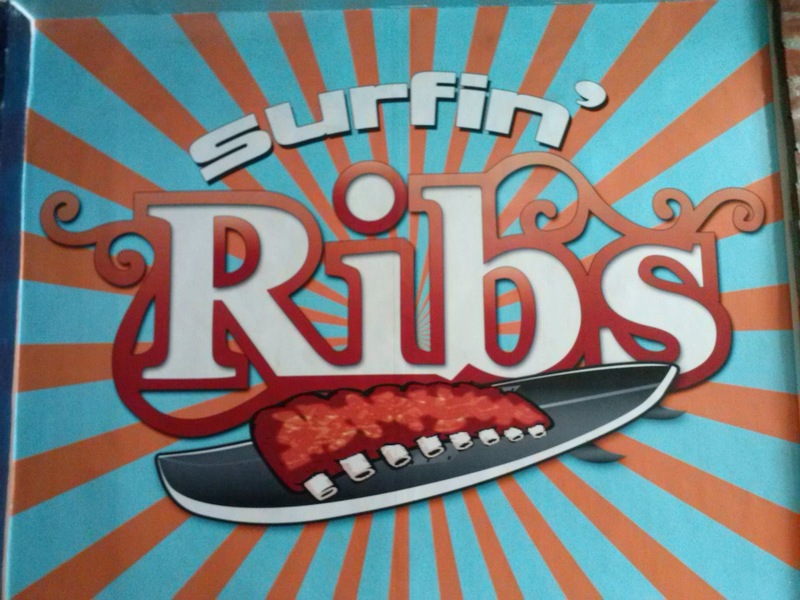 With appetites rising at quarter to 12 noon, Surfin' Ribs got us ribbed. So off we went to the station just a few blocks away. 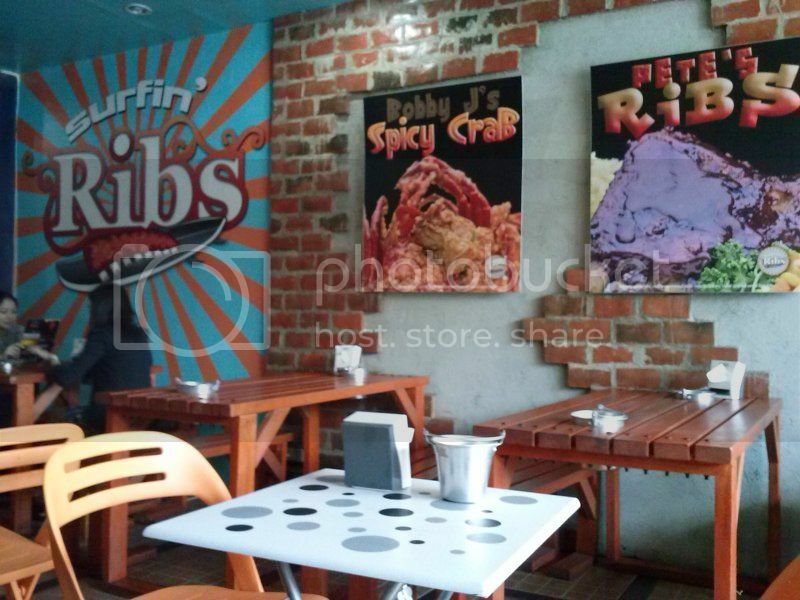 Surfin' Ribs took over the place vacated by Flame It at N. Escario Street, alongside Golden Peak Hotel. From outside, one will notice their huge store sign and the wooden tables with benches inside. You can walk into the store directly since there are no built-in swing/slide doors. Classy diners made for 5-Star hotels may cower seeing that dining is exposed to the exhausts and dusts from passing vehicles along the highway. 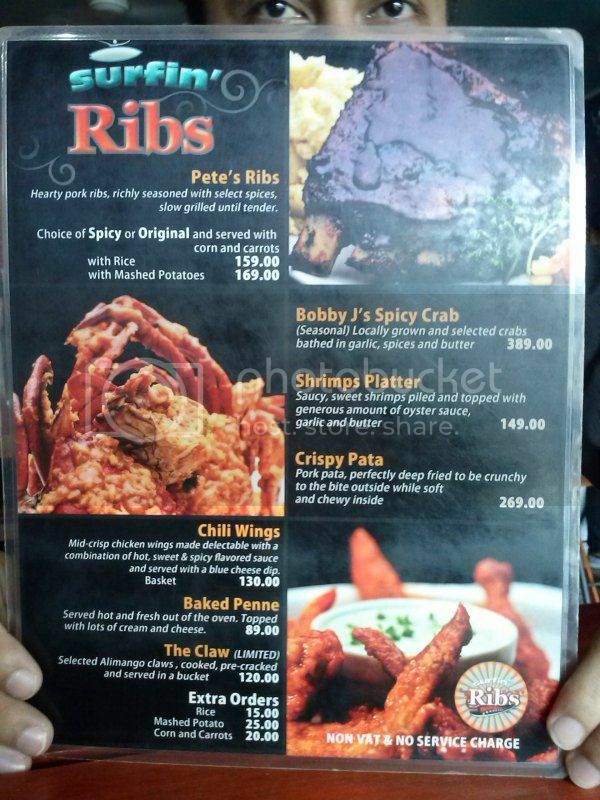 To us, however, it was just the right ambiance for a restaurant offering grilled ribs for a specialty. Besides, grilling food sinks in mostly as an outdoor activity, doesn't it? Once inside, you will notice huge graphics illustrating their menu and food offerings. The brick wall interior adds a lot to its rowdy rodeo look and cleanliness is well maintained. Service crew are quick to attend to new customers and willingly waits 'til the orders are final. 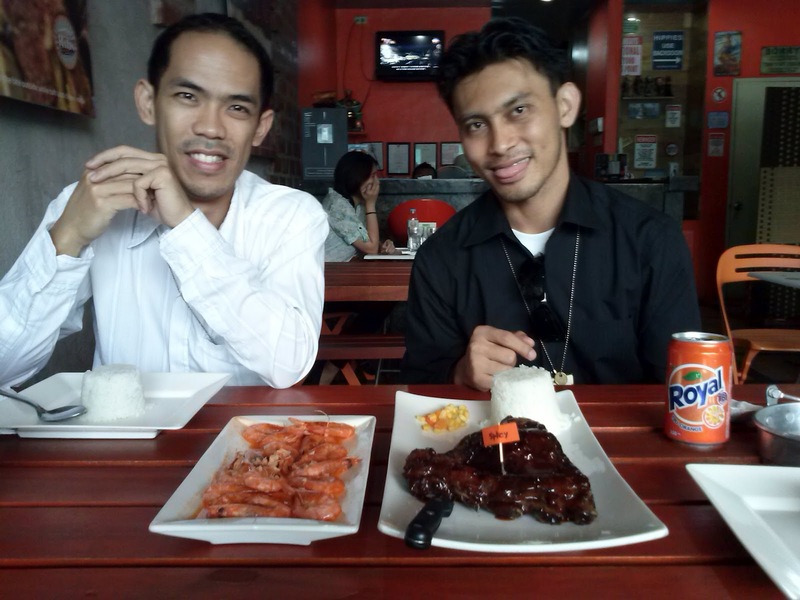 Since the servings were good for 2 to 3 persons we settled for a platter of the house specialty Spicy back ribs and a Shrimp Platter. In just a quarter of an hour, the food was served in neat presentations on big plates. The back ribs looked well done and came with corn and carrots sidings. 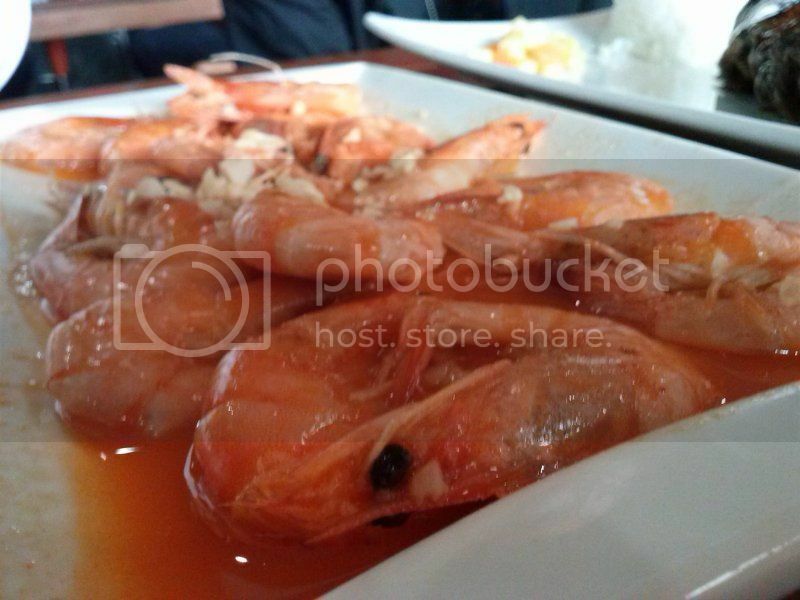 The shrimps smelled so good sauteed in generous amount of garlic. The ingredient was so prevalent that you can't help but enjoy the bursting flavor of shrimp juice, butter and fried garlic in the mouth. The saltiness level, however, can be improved a little bit as it tasted just a little too much in my palate. On freshness, one can tell that the shrimps were freshly picked early that day. The Spicy ribs didn't register as conventional. To most Filipinos, when something is labeled spicy, we associate it to being hot in the mouth due to chili. Their version was simply spicy (flavor of herbs) without a hint of hotness. A drop of hot sauce can definitely make the difference, if preferred. 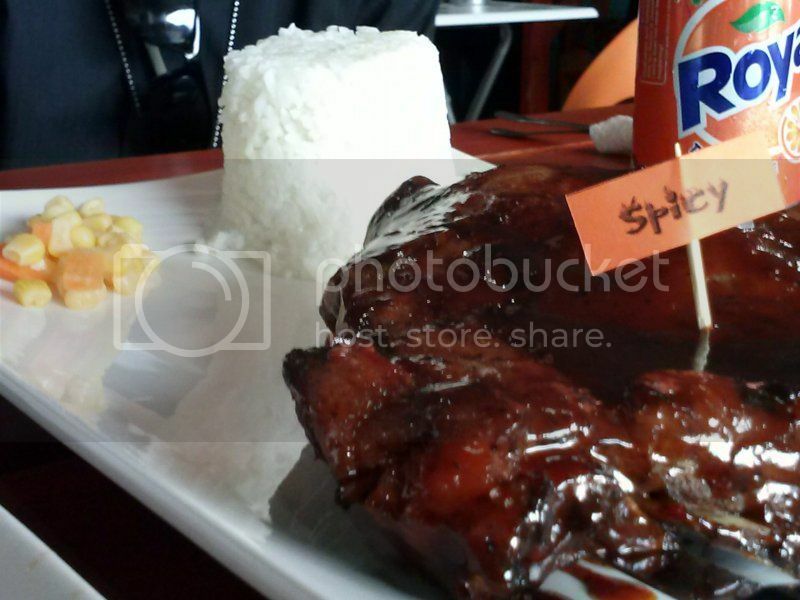 The mix of spicy ingredients plus sweet flavorful sauce, cooked to caramel texture is appetite gratifying. That sumptuous lunch cost us only a total of P158.00 each. After that meal, we decided to walk our way to our office in the hope of doing away with some of the fats gained. August was every employee’s most awaited month this year. It wasn’t Christmas, nor was it New Year. It just happened to have the most number of holidays following weekends compared to other months in the Philippines. For some, it meant “double pay”, if they had to work on a holiday. Others find it a bonus breather after long tiring work weeks. For me and many more like myself, it meant – travel. What was originally a group of 9 downsized to 5 after four of my friends had last minute decisions to forego the trip. I was already set for it and I thought nothing could change it. So, I packed a bag and left to meet my friends at the South Bus Terminal that Saturday morning. We were off for a Moalboal-Pescador-Terra Manna ride of our lives. I have been in Cebu for almost 5 years now and not once had I set foot on Moalboal white sands. It was more of the fulfillment of a plan than the idea of a new adventure that got me excited in creating the itinerary for the travel. The bus from the terminal left at around 7:30am and took us on a ride for over 2 hours before finally arriving at the Moalboal bus stop. We hired a cab at the price of P150 to take us to the church ruins, then to the public market, and lastly to Esther Escabas’ rooms for rent. We were greeted with Manang Esther’s smile and hospitality as she led us to her home. The perishable buys we brought were put in the freezer while the rest were hung in a plastic at the cottage ceiling. We unpacked, rested a little bit, and then headed off to the shore a few meters from the site. While the sun was up at around 3 o’clock in the afternoon, we decided to take snapshots of the scenic ocean and lively shores. At quick inspection, you would know from where we stood that Basdaku (the beach area) had certain spots guests favored over other locations due to longer and cleaner stretches of sand. The best thing about beaches is the fact that the shorelines in most cases remain a public place regardless of a fronting private resort, therefore, any visitor is free to walk along the beach lines. We headed back home when the night drew near and started cooking our dinner. The following morning, we woke up early to ready our food for our trip to Island Pescador. Although the islet was visible from our location, it took us close or a little over an hour to finally arrive at the foot of the island through a motor boat. The islet was a big rock in the middle of the sea, hence, there was no sand to set foot on. The boat had to be tied to what seemed like a crevice or a protrusion to keep it from moving away. Mind you, the rocks hurt virgin feet, therefore, it is recommended that you put on a pair of slippers to keep you from getting wounded when jumping or leaping from the boat to the rocky man-made stairs. When on the top of Island Pescador, one will likely be welcomed with the strong, relaxing sea breeze, a distant beach front view on one side, and a seemingly unending water expanse on the other. Two tamed cats will also greet guests as they get near in the hope of getting food rewards. The motorboat owner mentioned that they were city cats put on exile because they have become too numerous in their vicinity and instead of annihilating them, they had to be sent away to dwell in Pescador. Their daily ration depended on the constancy and frequency of townsmen’s visits. Exploring the islet will take you to the lighthouse, an old, worn-out shanty full of graffiti, and some unfinished structures. The other side of the islet is another stairway down to the foot of the island where corals abound. The effort to develop the area was noticeable, but the difficulty to make it happen was even eminent. Island Pescador remains a lonely place on top but very alive at the bottom with teeming corals and abundant underwater creatures. It was like heaven down there. A bright cast of light from the sun creates the glitter of crystal clear waters and the school of fishes swimming near is a revelation of life below it. If you are not a diver, you will get your fair share of this bounty even by snorkeling on shallow waters. The divers get the bonus of exploring the cave underneath the coral-adorned rock. 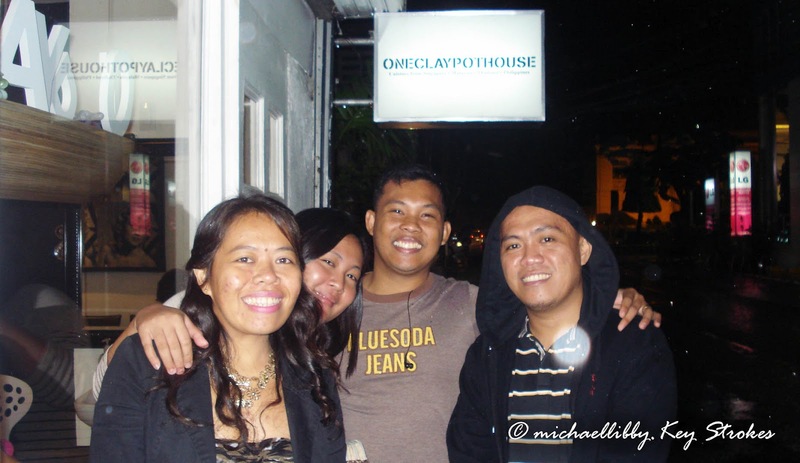 The trip to and fro was just right for all five of us at the price of P2000. Three or four hours of awesome experience were worth the dime. Right after lunch, we got ourselves ready for our trip to Terra Manna Resort in Badian. We contacted the cab driver that brought us to Manang Esther’s house to take us back to Moalboal town for the same price. Once at the town, we had to walk a few meters to the jeepney terminal that travels to Badian. We negotiated for another P150 fare with the driver to take us directly to the resort. Upon arrival, we were offered a thirst-quenching calamansi drink. At P600 per person, we were able to choose a family-size camping tent. While the staff set it up, we partially scouted the area and settled to sit by what looked like the usual brick walls in boulevards while we watched and waited the full setting of the sun. Of course, the trigger-happy photographers played with their DSLR and “Dili-SLR” cameras to their heart’s content. Dinner was served by their restaurant crew at Lantawan, a dainty table of 4 chairs under a ceiling of vines with draped shell curtains at the sides. The spot was situated right at the edge of the rocky camping hill overlooking the greeneries far below and vastness of the ocean reflecting the night sky and the moonlight. After dinner, we laughed hard as we dug at the pictures we took since the beginning of our weekend getaway beside the burning bonfire. Then we retired at the sound of crickets and my loud snore. Haha. A little past 5am, I woke up to get a glimpse of Terra Manna at day break. True as I hoped it would be, the fresh air, the gentle sunlight on your skin, the green home-grown vegetation, the bluish ocean near the horizon, the early morning dew on plants, the smell of coffee near the restaurant, the cold breeze, the feel of green grasses under the feet, the Lomboy (Duhat) tree which fruit I kept on picking, the quietness and serenity, were all reasons why Terra Manna was like paradise on earth for me. Further down, behind the cliff, spreads quietly a wide white sandy beach. We resolved to take a dip. Not contented with just dipping, we swam for about an hour notwithstanding the growing heat of sunlight. to Cebu town. It was Monday when we got back—a holiday.